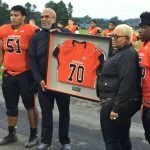 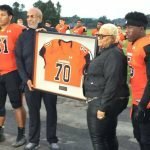 Marty McNair (second from left) and Tonya Wilson holds the framed McDonogh School jersey of their late son Jordan McNair, with McDonogh football captains D’Von Ellis (51) and Jabriel Johnson standing with them during a ceremony Friday evening. 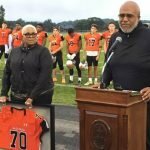 Jordan McNair, a 2016 McDonogh graduate, died in June after suffering a heatstroke during a football offseason workout at the University of Maryland in late May. 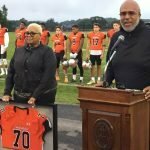 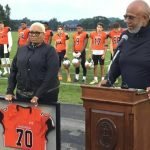 If anything, the pregame ceremony honoring the memory of former McDonogh standout Jordan McNair on Friday night was a springboard for the Eagles’ defense to hunker down against a powerhouse Malvern Prep team that had scored 49 and 35 points, respectively, to start its 2018 campaign. 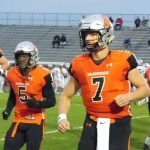 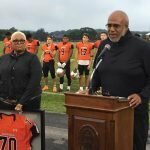 Unfortunately for eighth-ranked McDonogh, the Friars from Philadelphia were just as stout on defense — and opportunistic on offense — in their 19-3 triumph on a warm and wet night in Owings Mills. 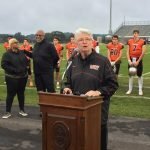 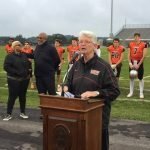 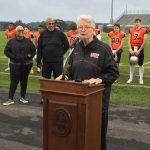 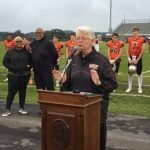 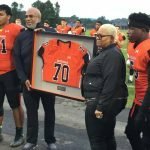 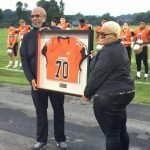 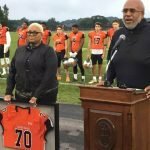 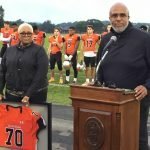 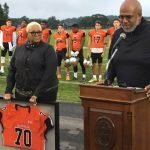 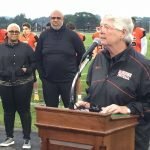 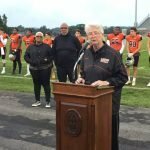 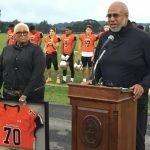 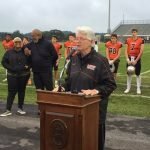 In a ceremony preceding kickoff, McDonogh retired McNair’s No. 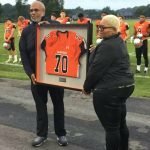 70 jersey. 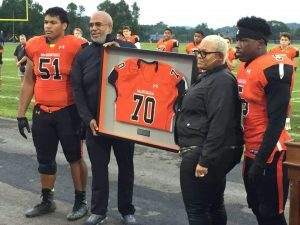 The 2016 McDonogh grad died in June from complications from heat stroke after a offseason workout at the University of Maryland where he was a redshirt freshman offensive linemen. 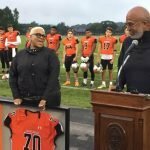 McNair’s mother, Tonya Wilson, stood a few feet from Marty McNair, with Jordan’s framed jersey. 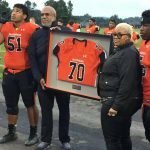 McNair was a standout two-way linemen at the Owings Mills private school. 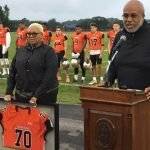 Jordan McNair was more than athlete. 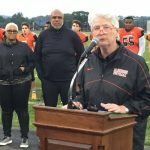 Longtime McDonogh athletic director Mickey Deegan said McNair worked diligently to transform his 2.3 GPA as a freshman to a 3.7 and a place on the school’s Dean List in his senior year. 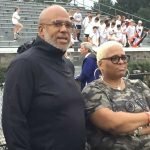 Ellis McKennie, a teammate of McNair at McDonogh and Maryland, was in attendance Friday with several former McDonogh classmates, family and friends. 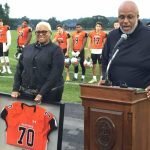 McNair’s jersey will hang inside the McDonogh’s Rollins-Luetkemeyer Athletic Center. The football team will wear the No. 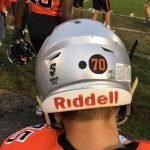 70 sticker on the back of their helmets this season. 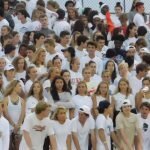 McDonogh played inspired, especially on the defensive end, not allowing a score in the opening half. 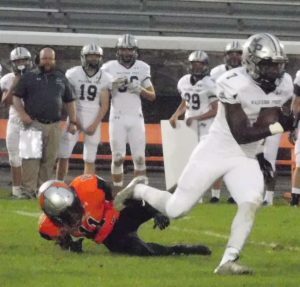 The Friars (3-0 overall), however, would strike first on a 22-yard interception return by senior linebacker Keith Maguire to grab a 7-0 lead late in the second quarter. 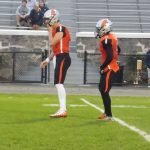 Earlier in the second quarter, McDonogh (1-2) stopped Malvern Prep from scoring after the visitors had a first-and-goal from the 4-yard line. 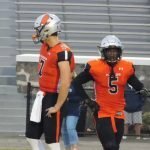 Junior defensive back Curtis Jacobs, was one of the Eagles who cut down Malvern Prep running back Rowan Watson for a 2-yard loss as he attempted to sweep around right end on fourth down. 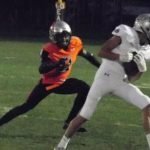 Shortly thereafter, Jacobs would leave the game and never return after injuring his left ankle. 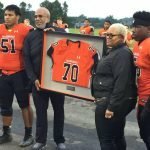 Even so, McDonogh’s ‘D, led by senior tackle D’Von Ellies, was stout for most of the rest of the game. 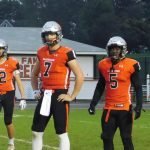 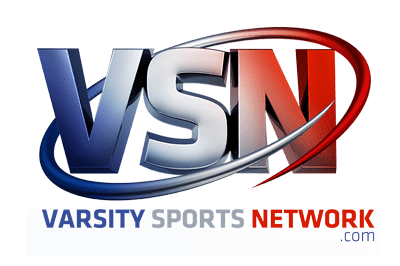 The play that broke the game open came after the Eagles had pulled to within 7-3 on junior kicker Harrison Beattie’s 37-yard field goal in the third quarter. 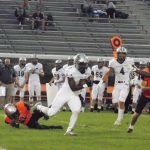 On a simple slant route, senior wideout TyGee Leach hauled in a pass from senior quarterback Drew Gunther and broke a couple of tackles on his way to the end zone to complete a game-altering 75-yard scoring play and boost the Friars’ advantage to 13-3 with under two minutes remaining in the third period. 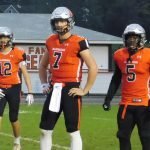 When Watson and several blockers practically carried him into the end zone early in the fourth quarter, the Eagles were too far behind to catch up. 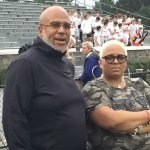 Malvern Prep coach David Gueriera said that changing his team’s offensive strategy to shorter passing routes paid off in the second half. 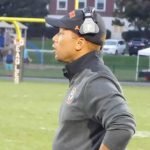 He also said that McDonogh’s defense had his team “stymied” for much of the game. 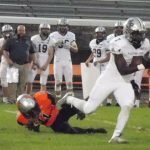 Malvern Prep running back Rowan Watson slips out of McDonogh’s Antoine Booth tackle attempt during the first half Friday. 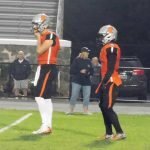 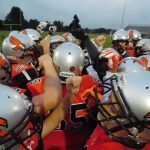 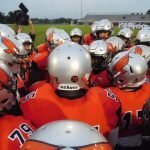 Watson scored a touchdown as Malvern handed the No. 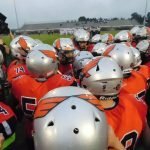 8 Eagles a second straight loss with a 19-3 decision at John McDonogh Stadium in Owings Mills. 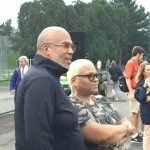 Gueriera was especially taken with Ellies, who had sacks along with junior linebackers Jackson Bonita and Ethan Robinson and freshman defensive back Aidan Hurdle.